I’d always wanted to work on refinishing furniture, and regularly visit blogs like Design Sponge for their Before and Afters, Shanty 2 Chic and Simple Home Life for inspiration. One day, there was this shabby, old dresser sitting outside my in-laws’ house. I passed by it a few times and I kept wondering whether I could fix it up, so I finally asked if they were getting rid of it. And they were! I asked if I could have it and they were more than willing to give it to me. In fact, they had asked someone to pick it up that morning to throw but she had to go and get a bigger cart because hers was full. It ain’t pretty, I can tell you that. And it’s OLD. Apparently, it was given to my husband when he was a baby. So that makes it at least 31 years old! Oh, the ideas that popped into my head! There was so much I wanted to do with this piece. First, was to install drawer guides. Next, I wanted to do a chevron print on the drawer faces. Oh but then I thought maybe I can convert it into a shoe cabinet instead! Then I thought maybe it would be a good idea to put a granite top and use it as a kitchen counter. Alas, none of those came to fruition. I’d been working on this project for a little over a month and I finally finished it over the weekend. It took longer than I expected, because I was hoping to get it all done in one weekend, but I kept getting sidetracked. All right, I confess: I started on it without having any idea how to go about doing whatever it was I wanted to do. So I had to do a lot of research on painting and installing drawer guides. First off, I had to remove the drawers and fix the bottoms. The bottoms are made of chipboard and I removed them because I had the idea of converting the drawers into doors. Then I realized that I wasn’t confident enough to do that so I nailed them back on. Then I removed the knobs and filled in the holes with putty. 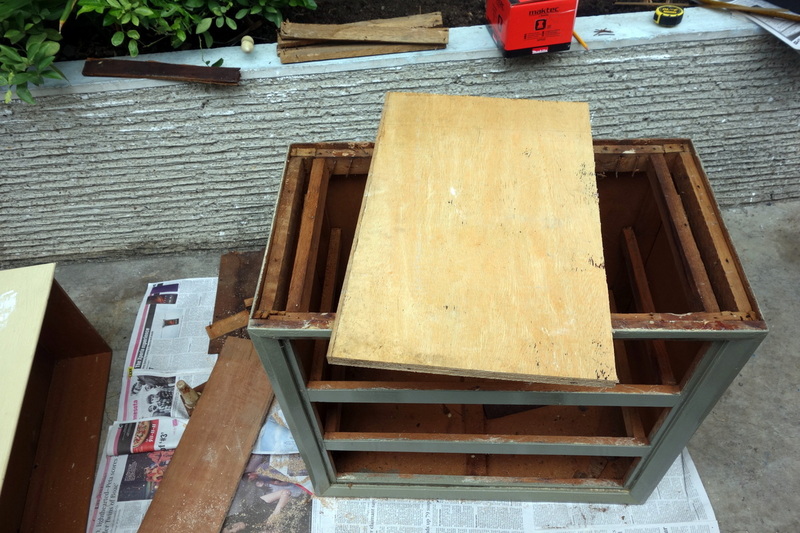 And I’m so proud – I bought my first power tool for this project! 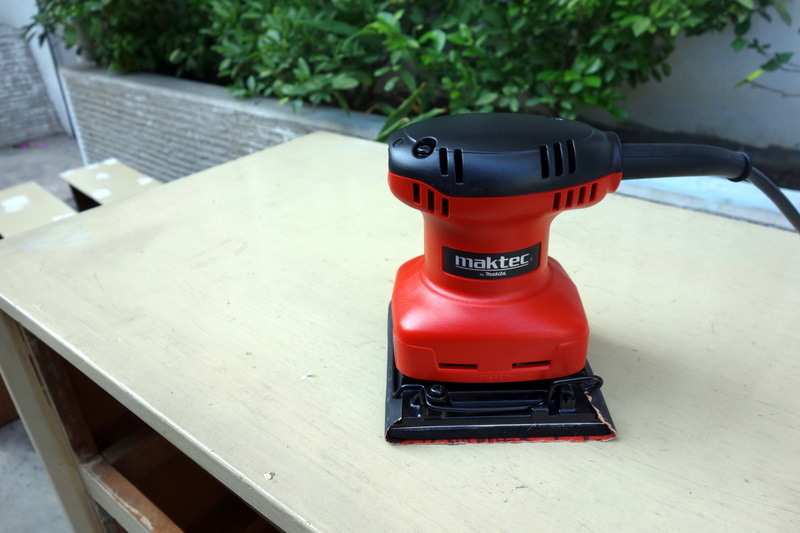 I bought a Maktec orbital sander. I sanded down the whole dresser, as well as the drawer faces (once the putty dried). I felt so very professional wearing my face mask and sanding the piece. Then the ruckus interrupted my daughter from her nap. Boo. Next, I painted everything gray. I was not at all happy with it though. I was trying to go for a darker gray, but silver gray was the only color. The paint color choices in Manila are so very poor. Plus the rollers I bought were crap. They left lint on my paint job! So I sanded it all down again. It was too late to go out and buy more paint (read: it was almost time for me to cook dinner) so I started on the bottom of the dresser. It had legs that I wanted to replace with caster wheels, and didn’t have much of a bottom, so I yanked those all out. I then cut the bottom to size from a spare piece of 3/4″ plywood I had lying around and nailed it into place. When I finally found the time to go to the hardware store, I bought black paint and mixed it into the gray until I got the shade I wanted. 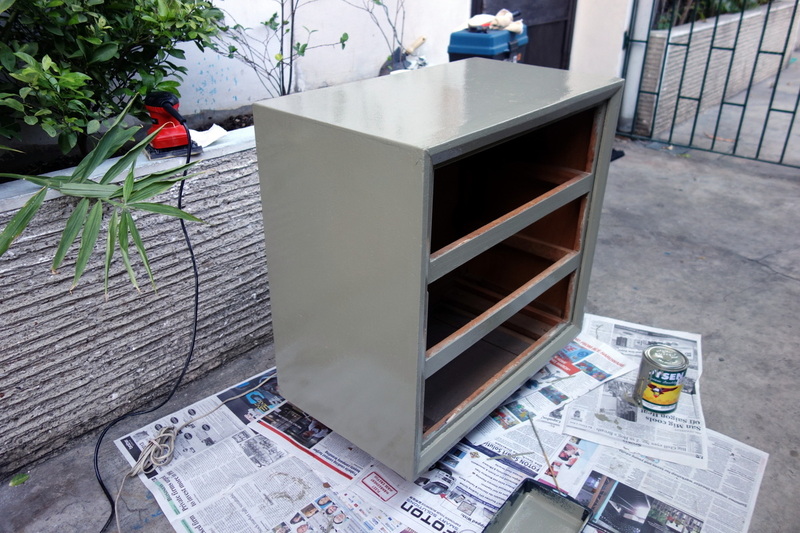 I painted the dresser and the drawer faces the new shade of gray. Then I figured a pop of color would be nice, so I painted the drawer sides yellow. I thought the yellow was a bit too bright. At this point, it was dark and my husband had come out to poke me and say it was time for dinner. 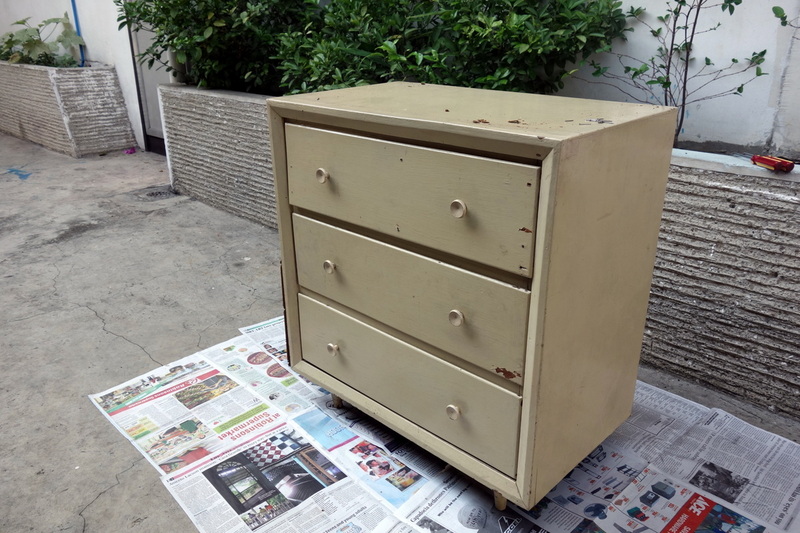 To rectify the horrid yellow shade, I added white to the yellow paint I had and repainted the drawer sides. 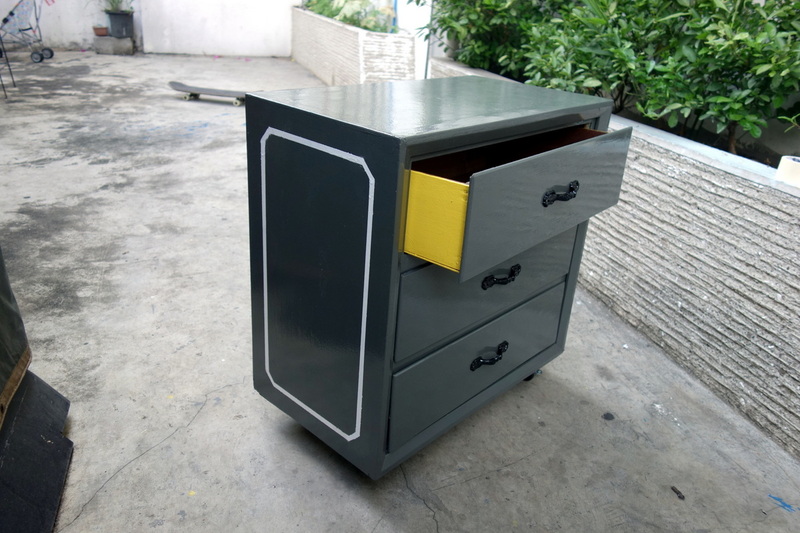 I did away with the chevron design on the drawers and instead bought some drawer pulls that I spray-painted black. I also bought drawer guides that took me a while to install. Over the weekend, I finally worked on the dresser again. I had researched on how to install the drawer guides, and had to add a wooden block to the inside of the walls to screw the guides onto. I had to contort my body and press my face against the cabinet just to get some angles right. Then I screwed the guides on one of the drawers and decided to try it. Lo and behold! The drawer no longer fit into the dresser. It was built just right for the drawer space, with no room for anything else. So I removed all the drawer guides and left it as is. What do you think? I also decided to paint some white detail on the sides, as inspired by this. I’m pretty happy with the way it turned out, but now I need to answer the question my husband has been asking me – where will I put it?